The end has come and I confess to not being ready for it. Yet, all good things must come to an end. I didn't meet all my goals (and am therefore annoyed at myself) but I did make some progress. Here was My Post of Great Beginnings. 1. 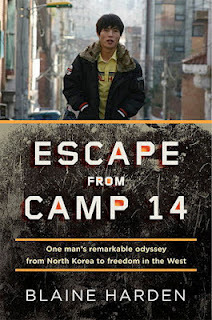 Escape from Camp 14 - I found this story to be intriguing, moving and powerful. It is not an easy read, but I rather recommend it all the same. 3. The Secret Life of a Fool - Moderately interesting. I can see how this book would be a very useful tool for some. 4. 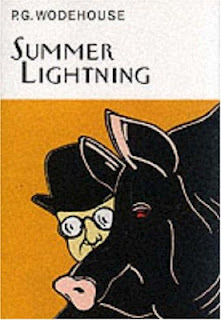 Summer Lightning, by P.G. Wodehouse - Wodehouse is always good for a laugh. 5. The Adventures of Tom Sawyer - This was a re-read for me and I'm so glad that I picked it up again! My opinion of it was altered by this particular reading. I was impressed by the value of re-reading books and plan to do that more often. Much more often! 6. 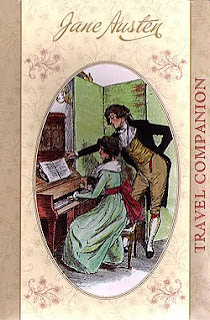 Emma, by Jane Austen - Another re-read that made for pleasant company. 7. Pippi Longstocking - This was my first experience with Pippi and I'm inclined to say that it is my last. However, a re-read of this one outloud might change my opinion. I reserve the right to change my mind. Of course, I also read many other books in addition to the ones listed above, but these were the ones I was primarily focused on getting to during the Spring Reading Thing challenge. Thank you, Katrina, for hosting this. You can bet I'll be participating in the Fall Into Reading Challenge which I hope organize my reading towards the end of the year. In the meantime, I'm looking forward to hosting The Chronicles of Narnia Reading Challenge next month. I'm ready to dive back into Narnia for a bit! Who's with me!? Tee, hee, isn't this so much fun?! I love looking back through books I've read. I'm definitely with you for Narnia! I have NO idea how I did. I need to look and write it up, I guess. I did plenty of reading, but I'm not sure if I hit my goals. I'm along for the read! Well, I think you did really well! It seems like the beginning of SRT was FOREVER ago! Did I know you gave up on Owen Meany? I don't think you missed out, but I hope that doesn't make me a rube. I actually just started reading Pippi Longstocking to my son, I'm enjoying it so far. Regarding #7: Pippi Longstocking is one of those books that all sorts of people expect me to have read but that I haven't yet read. I know my library owns a copy, so I'll get to it eventually. Until then, c'est la vie. I haven't read Pippi Longstocking in years but I remember loving it when I was younger. I love these challenges - and I, like you, tend to use them to help me focus on some reading goals I have. This time around, I focused on reading some books off my bookshelves, but due to new books out and library books coming in, I got a little sidetracked. 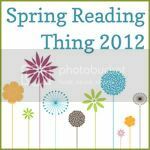 Have a great summer and if you get a chance, come check out my Spring Thing Wrap Up post. I have got to write down Escape from Camp 14. I keep forgetting. Going to get the pen now! Well, I forgot about this! I think I got 2 or 3 done off my original list. With all the reading and reviewing you manage to get in (along with taking care of your little ones! ), I don't think you're allowed to get annoyed with yourself. :) But I do understand the feeling... For the record, I think you did great this spring. C. finished up Lord of the Rings this week and has started on Narnia...he's already three books in. I might do some Narnia reading of my own this summer...it's been too long. Thanks for being part of the challenge, Carrie!